1,454 sq ft; lot: 0.94 acres - MLS# 1631664 Courtesy of Shorewest Realtors, Inc.
Nicely updated Cape Cod, old world charm, with almost an acre (113x368). 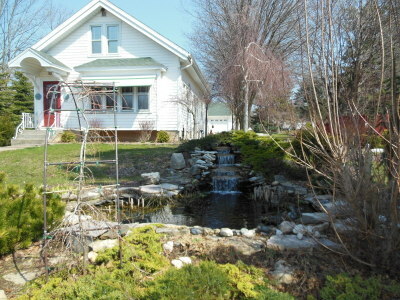 Park like yard, with 2 ponds, and waterfall. Extensively landscaped. Newer 30x42 garage with pull down ladder and reinforced rafters abovefor storage. A 50x50 fenced in garden (yes, lots of wildlife), 2 concrete yard lanterns, a Chiminea fireplace, fire pit, and a nice patio area in the yard, and a walk out deck on the second floor. Large first floor master bedroom, and a full bath on main floor. , as well as an 8x8 office/den. Two nice size bedrooms on the second floor, with asitting area/closet between. Home sits in a private setting, back from the street. Lg craft room in the LL. You will not want to miss out on this unique, captivating home!